On one Saturday morning Matthew decided to go rogue in the kitchen and not only create a huge mess that I had to clean up, but test out as many variations on fried chicken he could come up with. We ended up documenting our thoughts on each fried and baked version, and the results were unexpected. Check it out below! 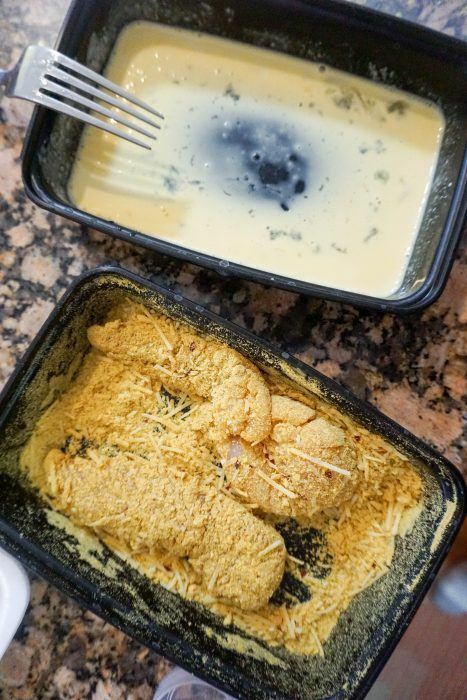 Since it was our first time using nutritional yeast, the Parmesan Breaded Chicken surprised us the most in terms of flavor and coating. You definitely want to make these at home! Breaded Chicken tenders Put To The Test! We covered two chicken tenders in each of the four following (below) breadings and baked one and fried one. This allowed us to put them to the truest of tests and really determine which was the best! Also, below, is the net carb per chicken tender covered in that particular breading. How did they match up? 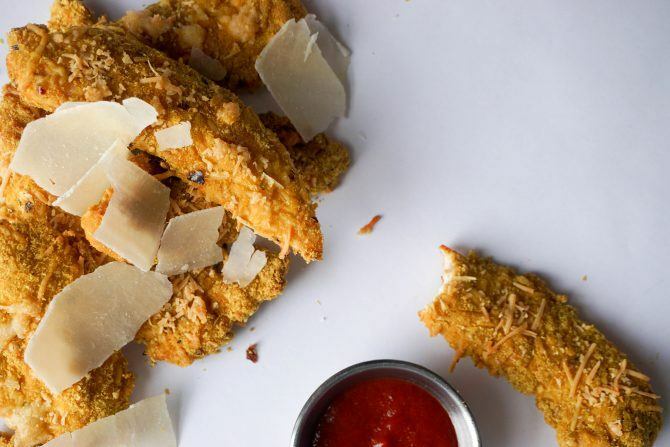 It's clear, that pork rinds won in the nutrition department, but after some considerable thought and reworking we decided that our Parmesan Breaded Chicken using nutritional yeast was the one we had to share with you the most! 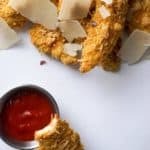 What makes these chicken tenders extremely juicy and moist every time you make them is the double cheese breading and baking instead of frying. Nutritional yeast basically acts as a cheese so mixed with parmesan you're getting some real flavor in each bite! Additionally, baking them with such thick coating of cheese allows them to retain their flavor and keep the moistness on the inside, just as it should be! We're always trying out different breadings to see what works best on what meat. The other night we did a light coating of coconut flour on some fresh tilapia and it was on point! It didn't dry out the fish whatsoever and opting to fry it instead of bake gave it a nice crispy outside and soft juicy inside. 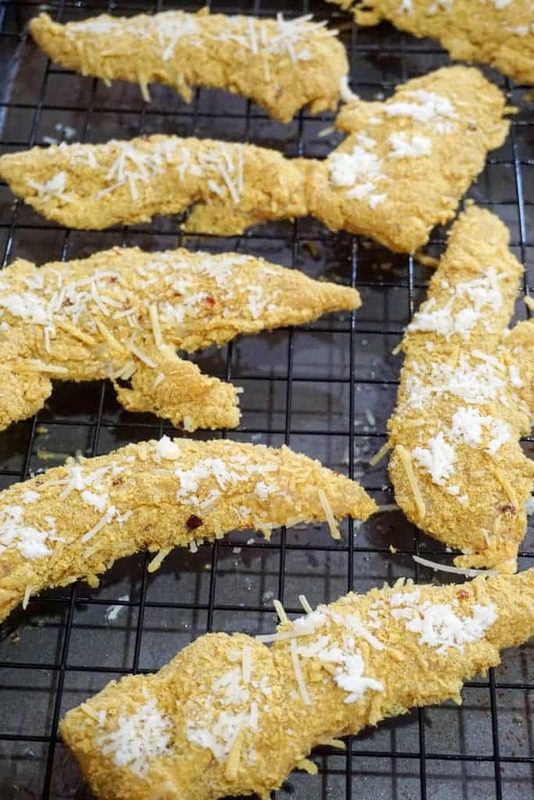 Although this has now become our favorite breading we have some great recipes that use different variations, so if you love breaded foods as much as we do give our Low Carb Onion Rings or Gluten Free Popcorn Chicken a try! Maybe you should do a fried chicken test at home and see if our Parmesan Breaded Chicken comes out on top! 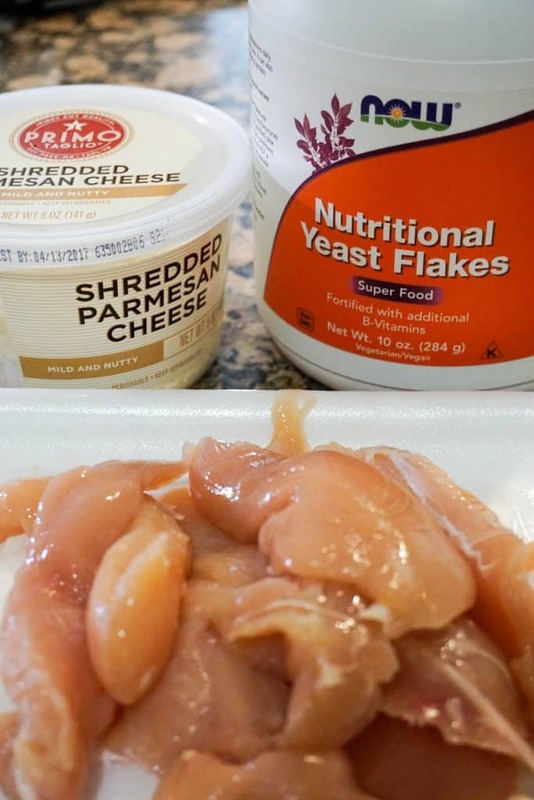 Recipe can be quickly added to MyFitnessPal - Search "KetoConnect - Parmesan Breaded Chicken"
Create breading mixture using parmesan, nutritional yeast and seasonings in a bowl. Make egg wash using egg and heavy whipping cream. Combine well. Place each tender in egg wash and then directly into breading mixture and coat well. It may be necessary to press the breading into the tense to ensure it all sticks well. Repeat this process until all tenders are coated and on a baking rack and baking sheet. Top the tender with a little extra coating and place in a 350 degree oven to bake for 30 minutes.